Belle promenade is located in the Sector 3 district of Bucharest, 1.7 miles from Carol Park and 1.8 miles from Patriarchal Cathedral. 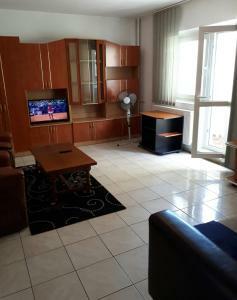 This apartment is 1.9 miles from Stavropoleos Church and 2 miles from Bucharest National Theater TNB. The apartment includes 2 bedrooms and a kitchen with an oven and a fridge. The air-conditioned apartment also has a flat-screen TV, and a bathroom with a bath and a shower. Revolution Square is 2.3 miles from Belle promenade, while Cismigiu Gardens is 2.4 miles from the property. When would you like to stay at Belle promenade? Vousaites les bien venu pour passer un séjour agréable! L'apartament il est à 5 minutes de marche à pied du grande centre commercial Mall Bucarest. House Rules Belle promenade takes special requests – add in the next step! Please inform Belle promenade of your expected arrival time in advance. You can use the Special Requests box when booking, or contact the property directly using the contact details in your confirmation. We need at least 5 reviews before we can calculate a review score. If you book and review your stay, you can help Belle promenade meet this goal.